PHOTO BY JILL GOSCHE Calvert's Hannah Kelbley (No. 23) watches as teammate Emma White hits the ball during the game against Danbury in Tiffin Tuesday. 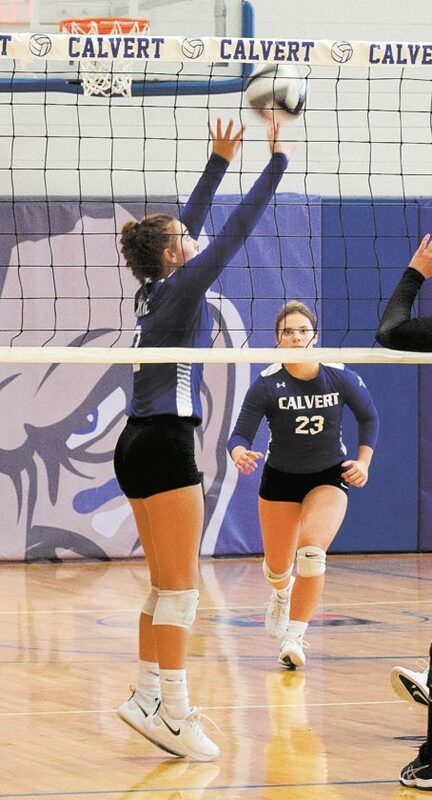 Calvert breezed past Danbury 25-5, 25-9, 25-10 Tuesday to pick up a Sandusky Bay Conference River Division victory. Emma White tossed up 14 assists for the Senecas (3-0) and Sophie Burtis handed out 11. Ashlyn Jones tallied eight kills and six digs, Shelby Hemminger came up with eight digs, Zoe Meyer drilled seven kills and four solo blocks and Lexie White smacked six kills. NEW WASHINGTON — Buckeye Central twice rallied back from defeats to even the match before powering past Seneca East 15-7 in the final game Tuesday to capture a Northern 10 Athletic Conference win. Upset-minded Seneca East battled to a 25-23 winner in the opener, but the Bucks (4-0, 3-0 N10) won the second game 25-10. The Tigers (2-3, 1-1) bounced back with a 25-14 win in the third, but Buckeye Central countered with a 25-13 victory to force the final game. Allison Weithman sparked the Bucks with 28 assists, eight digs, seven kills and six aces. Lexi Evak hammered 17 kills and five blocks and Lydia Ackerman (2 aces) chipped in 24 digs. Kendra Ackerman backed them with 10 digs and four kills, Allyson Stostalowski had eight digs, four kills and four blocks, and Alivia Niese (2 kills) lined three blocks. Meanwhile, Jessie Bowerman nearly had a triple-double for the Tigers with 18 kills, 12 assists and nine digs. Lauren Bogner registered 19 digs and three kills, Jillian Allgyre had 18 assists, seven digs and five kills, Megan Rife came up with 12 digs, Maria Phillips had 10 digs, Tori Fritz tallied six digs and five kills, Katrina Kagy drilled four kills and Alexis Hicks (2 blocks) belted three kills. NORWALK — Addison Conti tallied a triple-double and Emily Davis turned in a double-double Tuesday to lead unbeaten Columbian past Sandusky Bay Conference Lake Division foe Norwalk 25-19, 22-25, 25-20, 25-19. Conti led the way with 36 assists, 18 digs and 10 kills, and Davis (2 blocks) added 28 kills and 14 digs for the Tornadoes (5-0, 1-0 SBC). Hunter Breidenbach came up with 27 digs, Olivia Jacobs handed out 22 assists, Riley Roggow (2 aces, 2 blocks) drilled 14 kills, Amara Solomon belted five kills, Abby Dryfuse drilled three blocks and Toria Ingalls had two blocks and two digs. NEW RIEGEL — New Riegel overpowered Sandusky Bay Conference River Division foe Fremont St. Joe 25-17, 25-22, 25-14 Tuesday to move to 5-0. Aubrey Bouillon keyed the Blue Jackets with 19 assists, eight kills, five digs and two aces. Kaitlyn Kirian drilled 11 kills, Madalyn Reinhart had 11 digs, Jordan Hohman lined five kills, Julia Reinhart had three kills and three aces, Christen Hohman (2 aces) added three kills, Marianna Tiell came up with six digs and Sarah Schalk had five digs. SYCAMORE — Madi Chester had a double-double and Kaylee Ward approached one Tuesday as Mohawk handed Northern 10 Athletic Conference foe Colonel Crawford its first loss by a 25-14, 25-11, 25-17 margin. Chester (2 blocks) led the assault with 19 digs, 16 kills and three aces, while Ward (2 blocks) had 12 kills, eight digs and three aces for the Warriors (4-1, 1-1 N10). Alexa Konkle followed with 32 assists and six digs, Aubrey Margraf had nine digs, Ellie Shaw tallied seven digs, Paityn Clouse turned in five digs and four kills, Emma Myers-Huffman lined four kills and Tess Weinandy had two digs. ELMORE — Mary Harris nearly had a double-double Tuesday as Fostoria dispatched Northern Buckeye Conference foe Woodmore 25-9, 25-9, 25-11. Harris hammered 11 kills and nine aces and added six digs for the Redmen (3-0, 1-0 NBC). Tyriana Settles chipped in 16 kills and seven digs, Dakota Thomas provided 25 assists and six digs, Zoe Rice had six digs, Bailey Robinson registered three kills and three digs and Meredith Grine (2 aces) had three digs. SANDUSKY — Bellevue tripped Sandusky 25-11, 25-19, 25-23 Tuesday in Sandusky Bay Conference Lake Division play. Payton Vogel tallied 16 kills, 10 digs, four aces and three blocks for the Redmen and Taylor Baxter provided 13 kills and 10 digs. Molly Bullion backed them with 35 assists and four aces, Molly Dendinger added seven digs, Riley Mohr lined five kills and McKenna Davis drilled four kills. UPPER SANDUSKY — Carey out-scrapped Upper Sandusky 14-25, 25-22, 19-25, 25-14, 15-12 Tuesday in Northern 10 Athletic Conference play to claim its first win. Eve Smith’s 15 digs and 14 assists keyed the Rams (0-5, 0-2 N10) in the loss. Emily Hill (2 aces) had 19 digs, Kenedi Hayden drilled 12 kills and Savannah Kinley tossed up 10 assists. SANDUSKY — Perkins beat Clyde 25-18, 25-14, 25-14 Tuesday in Sandusky Bay Conference Lake Division action. Grace Ball approached a double-double for the Fliers in the loss, tallying 18 assists and nine digs. Ruby Schabel added 10 digs and seven kills for Clyde, Alexis Keegan had nine kills and six digs and Maddy Andecover lined four kills.